Move over, Apple and Google. 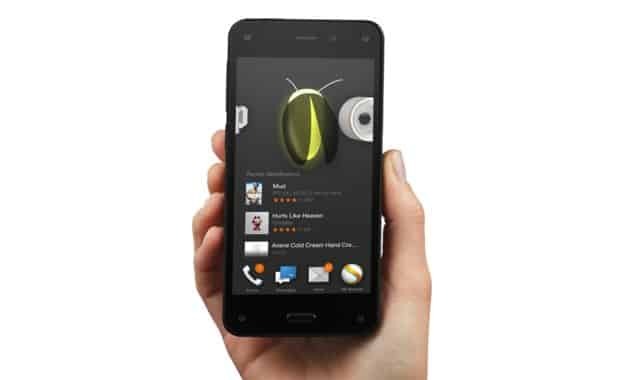 Amazon just announced its very own smartphone: the Fire, a svelte little number with a 3D (or 3D-ish) display, a camera that can recognize millions of products, songs, and even TV shows at the press of a button, and—perhaps best of all—unlimited cloud storage for all your snapshots. …that adds the illusion of depth to the Fire’s on-screen menus, lock screens, user interface, and so on. No, you won’t need 3D glasses to see this so-called “dynamic perspective” effect. Instead, the Fire phone tracks your head’s movement with a quartet of tiny, front-facing cameras and adjusts the image accordingly. Sounds neat (and no, I haven’t actually seen the 3D-ish screen in action yet), but doesn’t this also mean that the Fire phone is … well, always watching you through those four itty-bitty cameras? Hmmm. The feature is called “Firefly,” and it (again) uses the Fire phone’s camera to zero in on books, DVDs, artwork, bar codes, and so on. Once it recognizes an item, it pulls up all the details you can stand—plus, of course, a “buy it now!” button for anything that Amazon happens to sell. Firefly can also dial phone numbers or input email addresses it sees printed on, say, billboards or newspapers, and it can even identify songs on the radio or TV shows playing on your HDTV. Last but not least, you won’t need to pull up an app to start ID’ing products with Firefly; instead, you just press the dedicated Firefly button on the side of the phone. Unlike Apple and Google, Amazon is promising unlimited online storage for all your Fire snapshots. So yes, feel free to snap away, then go ahead and check out your pictures—all of them—in your Amazon Cloud Drive. Reading a Kindle book (what else?) on your Fire phone? Just tilt the screen to scroll through the text automatically. You can also lock the scrolling speed once you’re reading at a steady pace. In case you’re curious, the same four front-facing cameras that do the “dynamic perspective” trick also help out with the Fire’s tilt-to-scroll feature. …just as Amazon’s Fire tablets do. No surprise there. …good news for those with great AT&T reception, bad news for anyone (like me) who doesn’t. …for the 16GB version, or $299 with contract for the 32GB model. Also worth noting: Amazon will toss in a year-long Prime membership (worth $99) as part of a “limited introductory” offer. Not bad. …and you can pre-order it now—on Amazon, of course. Got questions about the Fire Phone? Post ’em in the comments below! What’s the difference between a “feature” phone and a smartphone?